FemShep's appeal isn't just about what she is, says BioWare's marketing boss, it's also about what she represents. Back in May, BioWare marketing director David Silverman asked fans on Twitter if they wanted to the female version of Commander Shepard, lovingly referred to as "FemShep," in the marketing material for Mass Effect 3. The response was overwhelming positive, and Silverman says that he is "blown away" by the level of passion and support that fans have demonstrated. Silverman said that it was "amazing" to be able to connect with fans on a one-to-one basis via social media, adding that it probably wouldn't have been possible a few years ago. As for why FemShep's moment in the sun has been such a long time coming, Silverman said that it would have made it very difficult to market the game effectively had BioWare given equal attention to both versions of Shepard. "When creating a rich sci-fi epic like Mass Effect," he explained. "You need to keep a certain level of consistency so people unfamiliar with the property can clearly identify who the hero is that they get to become ... had we released images showcasing both a male and female Shepard, people wouldn't be able to identify who the hero was or what was going on." 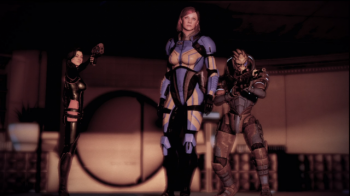 While he praised Jennifer Hale's vocal performance as FemShep and the strong script created by the Mass Effect's writing team, Silverman thought that a big part of the character's appeal was what she represented. "I think it's more about people celebrating and rallying around the fact that BioWare gives people the choice to step into the boots of a hero of their own creation and escape into an epic adventure," he said. "We want to make sure that we allow people to have full choice as to which gender they make their hero, what they look like, and even who they choose to have intimate relationships with." "It's one of the key things that makes a BioWare game unique and why we have such a passionate fan base. Everyone at BioWare is engrained with that mission and it's why we make the games we do," he added. While that "full choice" Silverman speaks about has occasionally been a little elusive in the Mass Effect games until now - homosexual men have had no romantic choices other than celibacy, for example - it's certainly true that BioWare as a company makes an effort to be inclusive. Dragon Age 2's lead writer David Gaider made the point rather nicely when he slapped down a homophobic fan complaining about being hit on by men earlier this year. "The majority has no inherent 'right' to get more options than anyone else," he said. "The very best we can do is give everyone a little bit of choice, and that's what we tried in [Dragon Age 2]."